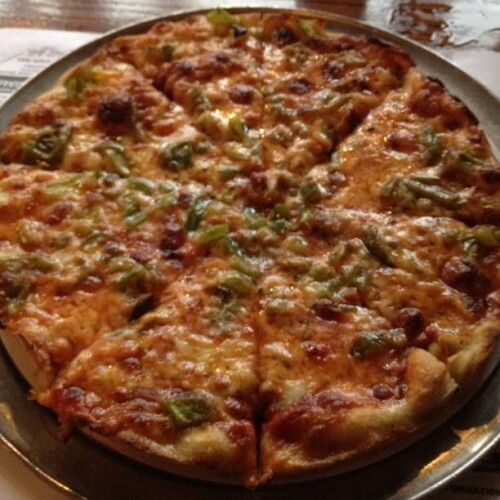 If there was one food that I had to commit to for the rest of my life, it would be pizza. It’s got everything that you need: some carbs, some protein, some veggies, some dairy. You can pack it full of flavor. It’s not even bad cold the next day. New York and Chicago will offer up their own geographical twists on all American classics. And if you ever have the chance to go to Italy and eat the real deal, you’ll wonder how we ever took something so utterly decadent and turned it into a mass-produced, frozen, greasy, boxed, nutritional nightmare. 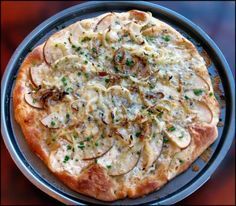 It seems like artisan pizzas, that is pizza of unique ingredients or flavor combinations, are becoming popular and trendy additions to many small plate, appetizer, and bar menus. Often called “flatbreads” to try to, one can only assume, make it sound classy, one can find pizza with macaroni and cheese, shrimp, quail eggs, meatballs, goat cheese, among a myriad of other toppings just around my own city. And if you start browsing Pinterest, well, you’ll find that you suddenly have enough pizza combinations to last you for years. Pear, goat cheese, caramelized shallot, and pecans! Brush a prepared pizza crust with olive oil, salt, and pepper. Allow to bake at 425 for 3-5 minutes. Arrange pears evenly around crust. Top with caramelized shallots, goat cheese, pecans, and sprinkle with herbs of your choice. (I used an Italian garlic blend). Bake according to pizza crust directions. Pro tip! : Caramelize shallots easily by cutting them into rings, separating them in the pan, and reducing them down with A LOT of butter. Deglaze the pan with red wine to help mild the sharpness of the shallot and to compliment the pear and goat cheese flavors! Bacon, arugula, smoked Gruyère, pesto. I mentioned this pizza in a previous post about awesome cheese because the smoked Gruyère on this pizza is my favorite. Spread pesto around a prepared pizza crust and bake at 425 for 5 minutes. A LOT of oil from the pesto is likely to bake up, so when removing the crust, allow to cool slightly, then blot excess oil before topping. Pile on the arugula (putting it down first will keep it from just falling off the pizza when you eat it!) cheese, and bacon. Bake according to the crust directions, and enjoy! 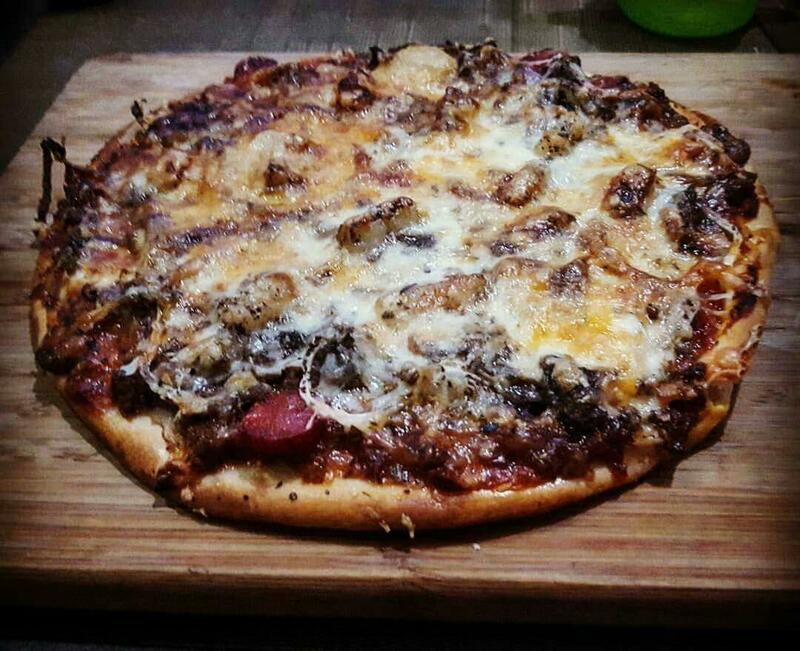 Braised beef, bleu cheese, mozzarella, caramelized mushroom and onion, steak sauce! The secret in this pizza in the sauce. Use steak sauce instead of pizza sauce for a savory and zesty base for this one. No need to bake the sauce down first, just pile on the toppings and cook according to the crust directions. Pro tip! This pizza is an EXCELLENT choice to use leftover pot roast. Make a roast early in the week, have pizza for supper a few days later! Inexplicably, we wound up with two more snow days this week, which has drastically reduced my ability to rehearse our spring musical. But my cast continued to rehearse at home and learn lines, and have been troopers with reschedule and missed days. Chris Nicholas of the blog The Renegade Press, was the reader responsible for ink.’s 500th post “like” this week! In the snow on Tuesday, I got stuck at the end of a friend’s driveway. You know how you have great friends? When they all bundle up in the snow and ice to push you back onto the road! Sometimes you just want a big, bold, buttery Chardonnay. That’s what you get with Bread & Butter Chardonnay. The Bread & Butter wine label may be more recognizable among red wine lovers as their Pinot noir and Cabernet are award winners, but the chardonnay has a lot to offer as well. A rich, buttery taste, aromatic notes of almond, vanilla, and fruit, along with just a touch of oak, round out a fully satisfying and highly drinkable flavor profile. Try it with fish or chicken. In fact, for an easy and amazing dash of flavor in your next chicken dish, use it deglaze the pan, as the base to a sauce or gravy. Certainly more expensive than traditional cooking wine, you won’t need to spare much to integrate the flavor into your savory dishes. We found Bread & Butter Chardonnay at Costco, and with a wide distribution area, it should be readily available in most local wine or liquor stores.